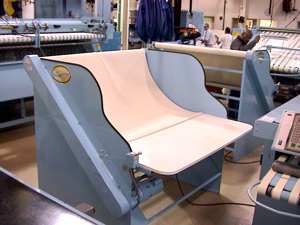 The Gardner Folding Station is designed to contain dried, laundered material and can be loaded by means of belt conveyors or slings. The unit is fitted with a heavy duck canvas apron which lowers inside the unit to accommodate the load. 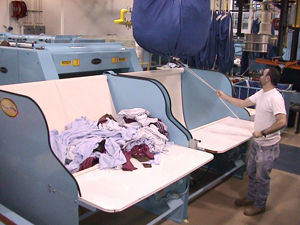 One end of the apron is attached to a motor drive roll operated by a forward/reverse electric control to raise or lower the load. When the operator raises the apron, the laundered material spills onto the laminate-covered table so that the laundered materials are always at the operator’s fingertips. This convenience eliminates stooping, reduces operator fatigue, and maximizes production of the hand fold operation. This unit can also be used in conjunction with small piece folding machines to increase productivity of those machines. An optional 304 stainless steel tabletop is available. 2009 Gardner Machinery Corporation. All rights reserved. All contents current at time of publication. Gardner Machinery Corporation reserves the right to change availability of any item on this website including its design, construction, and/or materials. Drawings and photographs on this website may not be reproduced by any means without permission.